Firefly, one of the fascinating beetle that abound in Malaysia at one time and is now fast disappearing due to the fast pace of development. Fortunately, there are still fireflies to be seen in Kuala Selangor, about 90 minutes or so drive from Kuala Lumpur. 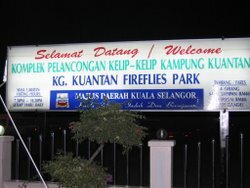 The entrance to Kampung Kuantan Fireflies Park. The two locations where visitors can go to are Kampung Kuantan and Kampung Bukit Belimbing in the district of Kuala Selangor. The mangrove trees called "berembang trees" by the local grow along the riverbanks of Kuala Selangor river. 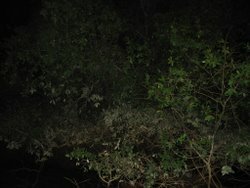 These are the trees where the fireflies or "kelip kelip" in the local language stay and feed on its leaves. During the day, they retreat to the grasses near the mangrove trees. When night falls, the fireflies will feed on the nectar of the leaves and attract mates with their synchronised flashing green light. The thorax of the insect produces a green grow that flashes at a frequency of 1/3 Hz, or 3 flashes in one second. Each of the berembang tree has different groups of fireflies and each group has flashes that are synchronised. The fireflies found here is from the "Pteroptye tener" species and is about 6cm in length. They have a lifespan of about 2-3 months. 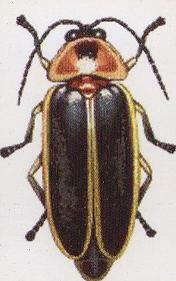 The picture of a typical firefly found here. The best time to visit the park is after nightfall at approximately 7:30pm to 7:45pm. It is also advisable to go when it is not full moon and not during raining evening. Usually the place is quite packed during the weekends hence try to go during weekdays. One should take note that once the kelip kelip has found its mate, the flashing would stop, usually by 11.00 pm. Make sure that you do not go too late as the park is opened from 7:30pm and closes at 10:30pm. The non motorised canoe ride. One will have to purchase a ticket costing RM10/person to take a canoe ride along the river. The ticket includes a bottle of drink and a 30 minutes to 45 minutes slow cruise along the river. Life jacket will be provided during the ride. The scientific name of Berembang tree is called "Sonneratia Caselaris" and is a type of mangrove tree that grows wild near the banks of Selangor River where the damp and swampy environment cause it to grow well. Besides being a source of food for the fireflies, it also acts as a filter that filters the dirt and poison from the river that produces clean water for the other living creatures. The living creatures that thrives here are the crabs, fish, birds and prawns. 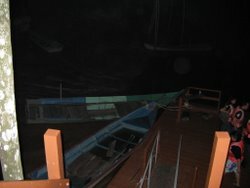 Take note that you are not allowed to use camera with flash to take pictures during the cruise as this will disturb the habitat of the fireflies. If you need to take camera, bring a night vision camera. A binocular will come in handy during the cruise. If you would like to enjoy the village life for a night, there are chalets where you can stay overnight at Kampung Bukit Belimbing at a reasonable rate. As for me, an educational night trip with my children to this place is good enough to remember for a long time. If you find that the weather is a bit unpredictable and want to be sure, call up the firefly parks that you wish to visit and ask the person in charge whether that night is a good night to go. Do you have a firefly story to tell or experience that you would like to share? Please use the form below to submit your story and thanks for sharing. If you are thinking of eating some special food in the vicinity, go to Pasir Penambang and you will find many sea food restaurants there. It is located just after Malawati Hill in Kuala Selangor.